Obsolescence doesn’t make old gadgets disappear, but it does make people forget about them. And that’s a problem. 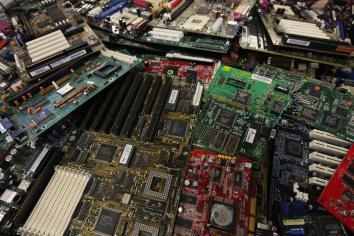 A new U.N. report shows that the volume of e-waste worldwide will rise 33 percent by 2017 to 65.4 million tons. A lot of the issue comes from the United States, which has the most annual e-waste with 9.4 million tons, and an average of about 65 pounds per person. China follows up with 7.3 million tons total, but only about 12 pounds per individual. The “Solving the E-Waste Problem” (StEP) Initiative also released an interactive map that shows country-level e-waste data around the world for anything with a battery and/or a power cord. The map allows easy access to information about a country’s population, average individual purchasing power, e-waste put on the market and generated per year, and any disposal regulations currently in place in for e-waste. E-waste is an environmental and health concern because it can cause heavy metals and other toxic substances to contaminate soil and water. Additionally, people looking to recover precious metals or other parts sometimes scavenge and break down devices that were not disposed of properly, and in the process they can release toxins into the air. As the Guardian points out, Interpol also released a statement last month indicating that e-waste from industrialized countries is being illegally unloaded on developing nations. Interpol is initiating criminal investigations into 40 companies, citing agent reports that for every three containers being checked on their way out of the EU, one holds some type of illegal e-waste. Exporting old electronics is not necessarily illegal if they are being repurposed or reused in some way, but Interpol says that much of the “exporting” going on is really tantamount to dumping. To keep up with rising e-waste rates and movement around the globe, the StEP Initiative says the data sets that power the map will be updated regularly.